Strategically located in central Singapore, Dorsett Singapore is a relatively new hotel well designed for business, leisure travelers and staycations for the locals. Smacked right outside Outram Park Station, it is surrounded by nostalgic sights and heritage trails. Here you can find many eateries and restaurants located around the corner of Keong Saik Road or just take a 5 minutes stroll over to the bustling Chinatown. We booked a staycation over the Valentine’s Day weekend and got to check out the latest addition to Dorsett Singapore, the Loft Room. I am impressed with the impeccable service here, the staff are extremely polite and made every effort to hasten our check-in process. They even acceded to my boyfriend’s request of a late check-out, as well as provided us with a wonderfully decorated room with colourful heart-shaped balloons and origami towels on our beds! Cleverly designed with limited space (with a a room size of only 25 sqm), we were impressed with its ingenious layout to maximize space and comfort, where it accentuates the key concept of innovation and modernity to offer a whole new living experience. On the 1st-floor, the room is fitted with a spacious living room centre, bathroom and a full-height cupboard which can be accessed from both the bathroom and the living room. Each loft is also equipped with two 40″ LED Television with International and Cable TV channels. We absolutely loved the full height glass windows, allowing for more natural light to flood through the room. It also visually enhanced the overall aesthetic of the room, a perspective technique to enlarge the spaces! The bedroom is located on the second floor and comes with a king size bed, with a posturepedic mattress which explains how comfortable it was, we definitely had a good sleep! The entire bedspread was indeed a cozy haven to rejuvenate in. The hotel’s facilities also includes an outdoor 30-meter swimming pool and Jacuzzi, overlooking the bustling city area. A perfect spot for a morning dip or simply to rejuvenate the afternoon away. 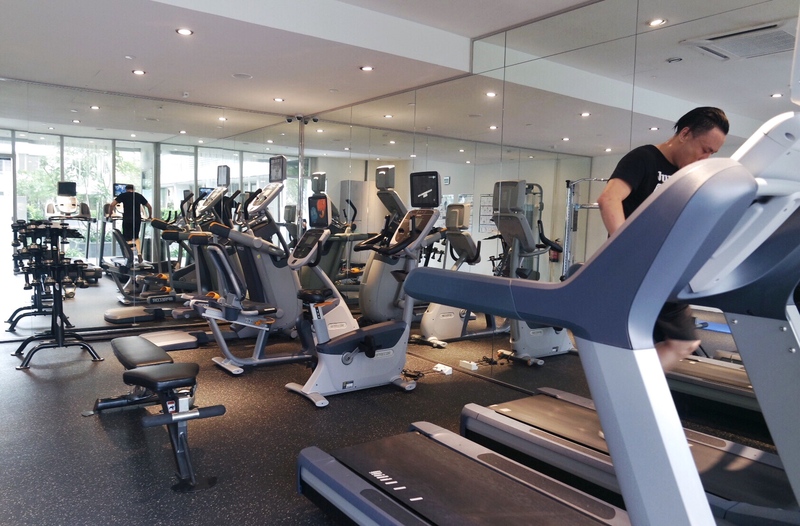 The indoor gym is located on the same level as the swimming pool, not too big but it is fully equipped with a variety of cardio training machines as well as free weights for those going on an endurance/strength training regime. The next morning, we took a short stroll to Chinatown and indulged in a breakfast spread of dim sum at Tak Po. Overall, the Loft Room design is one of the best space-saving solutions, and it was a cozy and comfortable stay experience at Dorsett Singapore. Nice review! I didn’t know they offer Loft Room in Dorsett.